Around the world in...as long as it takes! What a great day we had today (and it wasn’t just because I found another cool piece of street art)! The weather wasn’t great – grey, cloudy, and windy most of the day (no rain though, thankfully!). We had several things planned, so we got a slightly earlier start than yesterday, hoping to stop by a local raw food/juice bar for Scott before we started our day. Sadly, the one by us that we were so delighted to discover yesterday was closed! Don’t worry though – Jay’s Juices came to the rescue again (albeit later in the day when we were close to it). 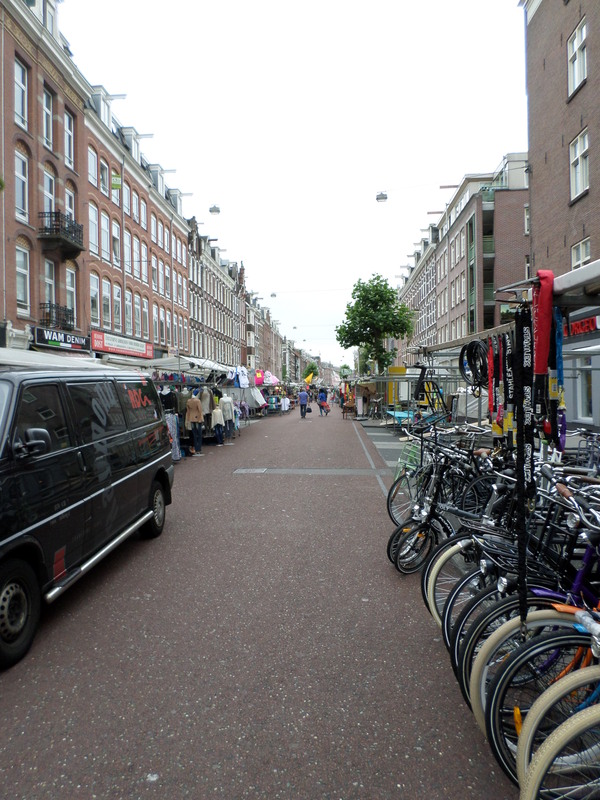 After the failed attempt to get juice, we made our way to the Albert Cuyp Market, which is south of the city center. It’s a large outdoor market, very similar to what you find in many large cities. If you’re interested in picking through cheap electronics, tacky t-shirts, and other similar wares or if you like the ambience of an outdoor market, you should check this one out. Neither Scott nor I are big into that, so we could easily have skipped it and been fine. We did enjoy the delicious treats we had there though! If you visit, you have to try both poffertjes (sort of like a cross between a small donut and French toast) and stroopwafel (like two very thin waffles or pancakes squished together with yummy maple syrup between them). Of course, since walking the market was a bust, but eating was a win, we figured we should keep doing what we were good at and eat some more, so we stopped for lunch at Bazar, a Middle Eastern restaurant right in the market. Our food (hummus, falafel, and mince beef/lamb kafta) were pretty good, but not amazing. The place was big and pretty empty (though we did eat lunch a bit early, so that may be why), but the service was decent as were the prices, so I could recommend this one. After lunch, we went into the city center to the Museum Willet-Holthuysen, which was cool because it gave us the chance to walk around one of the amazing canal row houses that are all over Amsterdam (it was previously a private home, but was donated to the city when the owner died in 1895). This museum was another freebie because of our I Amsterdam card, but I think it still would have been worth the €8 admission fee. 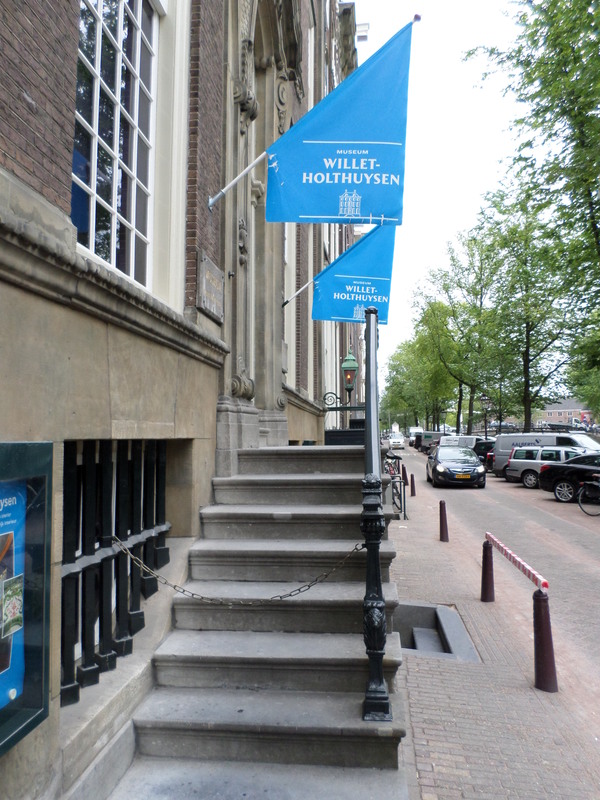 From the Willet-Holthuysen, we wandered over to the Anne Frank House, but we were ahead of schedule based on the entry time we pre-purchased tickets for, so we had a quick wander through Westerkerk Church, which is right next door. I was excited to get to the Anne Frank House, though I knew it would be somewhat sobering. As I mentioned, we purchased tickets a day or two ahead of our visit – I can’t recommend that enough! There had to have been 100 people in line, but the museum has a separate door for online tickets, so we went in through there and walked immediately into the museum. Seeing the place that kept the Frank family, along with others, safe for two years was a great experience. When you realize how difficult it must have been to live in secret for that long and how frustrating and terrifying it was for them to be ratted out and captured, the house takes on that much more importance. 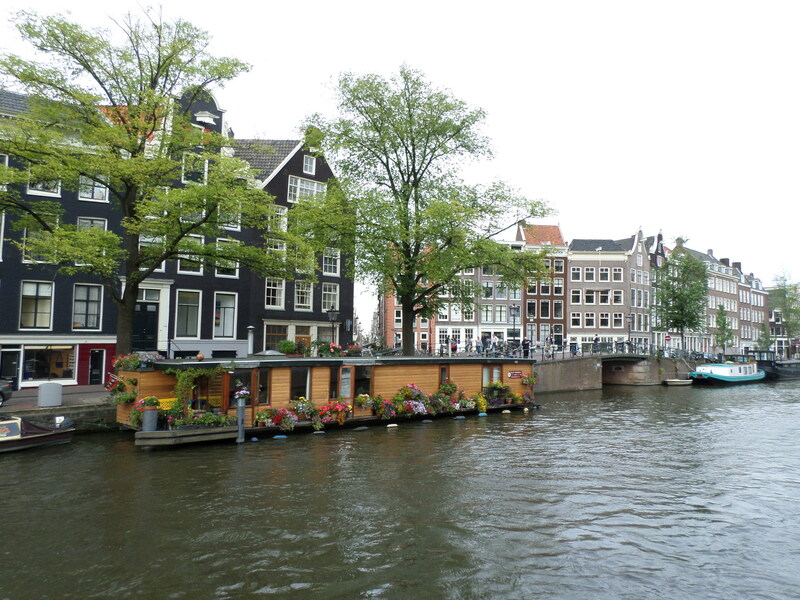 Be sure to visit if you’re in Amsterdam, especially if you have children. It provides a good opportunity to share a powerful message about the indelible marks young people can leave on the world. 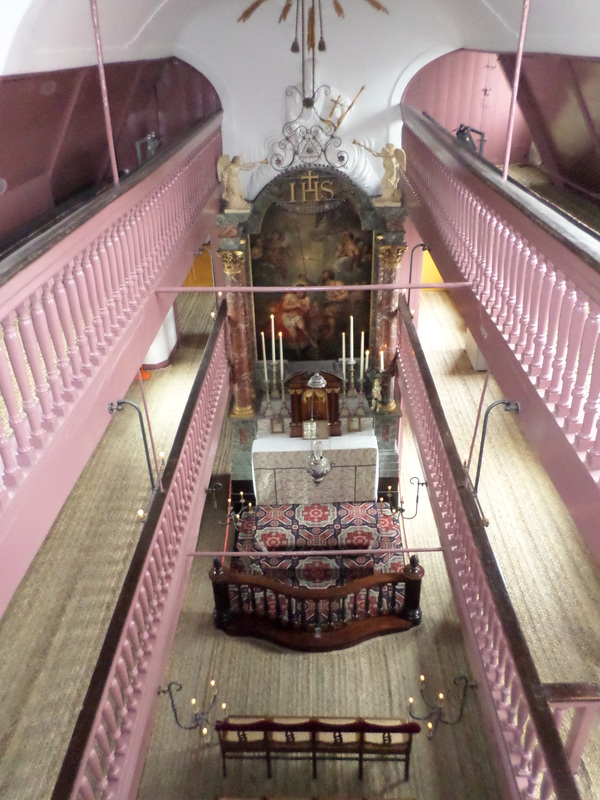 Our final stop of the day was at Our Lord in the Attic, a museum in the Red Light District (in case you’re wondering, its content has nothing to do with that area). This was my favorite stop during our time in Amsterdam! We got in for free at this one, too (gotta love value for money!) and it was a super-interesting building to see. It tells (and shows) the story of a man who bought three adjacent buildings and converted the attic space of all three into one hidden Catholic church. It served as a functioning church for over 200 years, during a period in Holland in which it was illegal to openly practice Catholicism. Learning about it and seeing how they pulled it off was fascinating! The rest of our day consisted of winding our way back to our apartment, where we spent some time recharging and then went out to dinner and a walk along the canal that runs by our apartment. Want to see our day in photos? Scroll on! Looking down the stalls at Albert Cuyp Market. Exterior of the Museum Willet-Holthuysen. 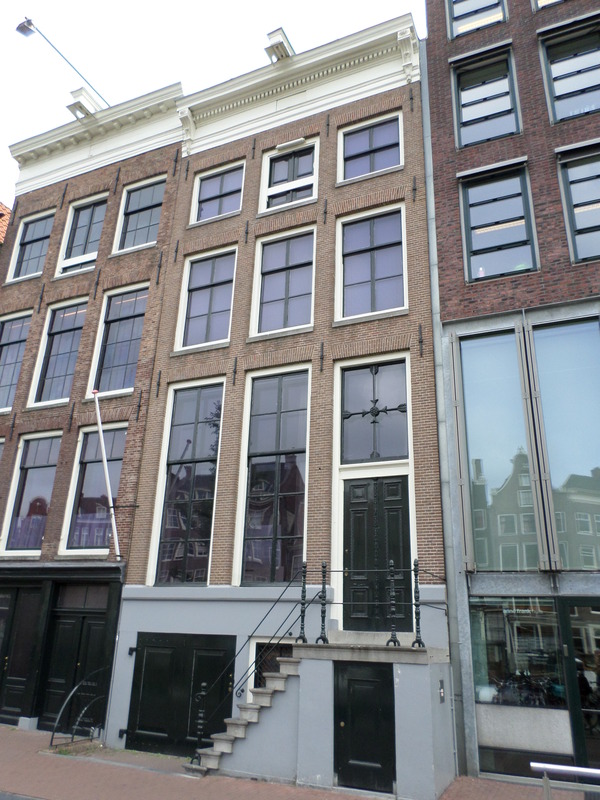 Exterior of the Anne Frank House. Exterior of Our Lord in the Attic. I had to include this interior shot of the church itself. Amazing! 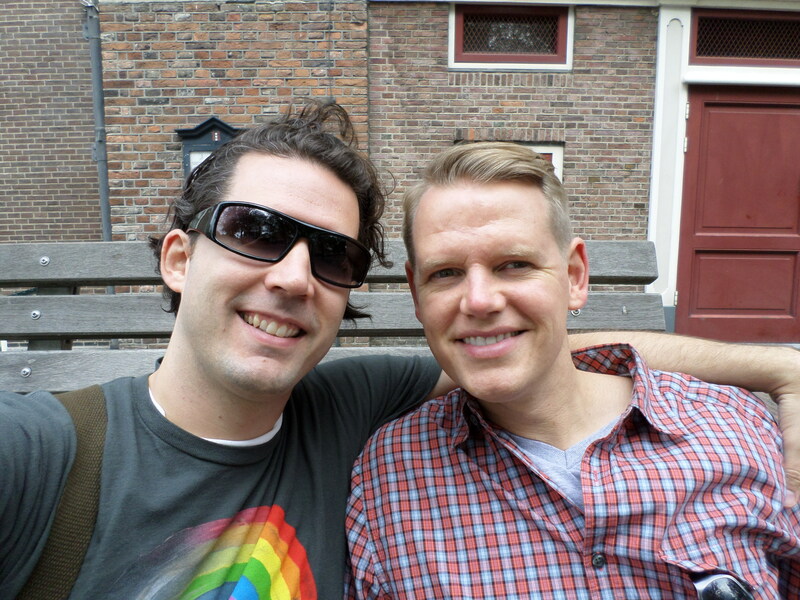 A very Amsterdam-looking shot by the canal off of Prinsengracht in front of the Anne Frank house. The two of us looking a bit windblown. And that’s it for Amsterdam! We’ve already packed up our things for our train trip to Bruges tomorrow morning. We’re only staying for one night, so we don’t have time to do much, but if we don’t at least get to the Belfort and the Basilica of the Holy Blood, I’ll be disappointed. 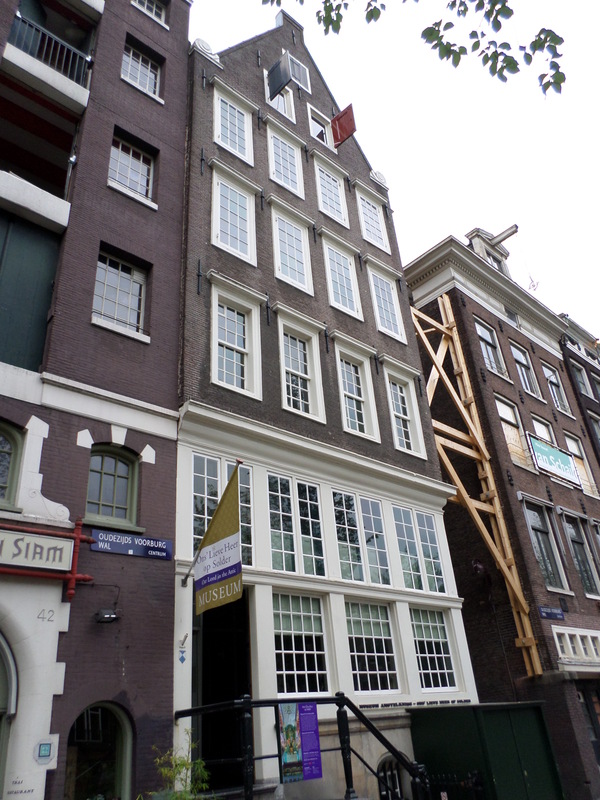 Perfect description of the Anne Frank House: “sobering.” I felt the same way. It’s difficult to believe (understand) that Catholicism was “banned” from Holland for two centuries! Fear is an incredible force, indeed. Based in St. Paul, MN and love to blog about travel. Comment, follow, and join me on my journey!